An Urgent Message From Your Children is a Public Service Video Series featuring children speaking in their own words to adults, expressing their fears, concerns and their hopes for the future of our planet, and making an appeal to all of us to respond with appropriate urgency. We made the video above with an incredible group of kids (all under 13 years old). The videos below are submissions from kids and their parents, teachers or friends. 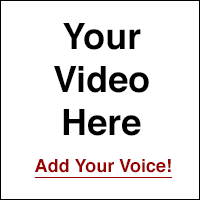 Make your own video and Add Your Voice. is a project of We, The World for the WE Campaign.